The latest release of "Harry Potter and the Half-Blood Prince"
Daniel Radcliffe, Rupert Grint, Emma Watson, Jim Broadbent, Helena Bonham Carter, Robbie Coltrane, Warwick Davis, Michael Gambon, Alan Rickman, Maggie Smith, Timothy Spall, David Thewlis, Julie Walters, David Bradley, Jessie Cave, Frank Dillane, Tom Felton, Matthew Lewis, Evanna Lynch, Helen McCrory, Natalia Tena, Hero Fiennes Tiffin, Bonnie Wright. Read Cast biographies. "I took no pleasure at all in bringing legal action and am delighted that this issue has been resolved favourably," said J.K. Rowling. "I went to court to uphold the right of authors everywhere to protect their own original work. The court has upheld that right. The proposed book took an enormous amount of my work and added virtually no original commentary of its own. Now the court has ordered that it must not be published. Many books have been published which offer original insights into the world of Harry Potter. The Lexicon just is not one of them." The latest Harry Potter movie news is posted through Fandango's RSS News Feed. Read fan reviews and post your own comments and ratings. Fantasy Adventure. Voldemort is tightening his grip on both the Muggle and wizarding worlds and Hogwarts is no longer the safe haven it once was. Harry suspects that dangers may even lie within the castle, but Dumbledore is more intent upon preparing him for the final battle that he knows is fast approaching. Together they work to find the key to unlock Voldemort’s defenses and, to this end, Dumbledore recruits his old friend and colleague, the well-connected and unsuspecting bon vivant Professor Horace Slughorn, whom he believes holds crucial information. Meanwhile, the students are under attack from a very different adversary as teenage hormones rage across the ramparts. Harry finds himself more and more drawn to Ginny, but so is Dean Thomas. And Lavender Brown has decided that Ron is the one for her, only she hadn't counted on Romilda Vane's chocolates! And then there's Hermione, simmering with jealously but determined not to show her feelings. As romance blossoms, one student remains aloof. Harry Potter is determined to make his mark, albeit a dark one. Love is in the air, but tragedy lies ahead and Hogwarts may never be the same again. Continue reading about the movie production notes. 10% OFF Harry Potter Merchandise. The WBShop.com sell toys, games, clothing, posters and more from your favorite Warner Bros. characters like Tweety & Superman and from your favorite WB movies like Harry Potter. Get free ground shipping. Check for clearance and seasonal deals. Click here to buy your official Harry Potter Collectible Time Turner at the Harry Potter Shop. Amazon.com: The long-awaited, eagerly anticipated, arguably over-hyped Harry Potter and the Half-Blood Prince has arrived, and the question on the minds of kids, adults, fans, and skeptics alike is, "Is it worth the hype?" The answer, luckily, is simple: yep. 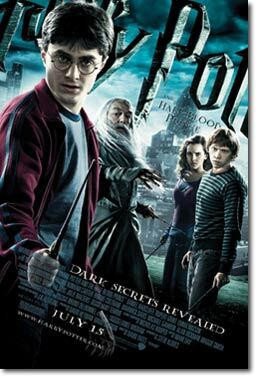 A magnificent spectacle more than worth the price of admission, Harry Potter and the Half-Blood Prince will blow you away. However, given that so much has gone into protecting the secrets of the book (including armored trucks and injunctions), don't expect any spoilers in this review. It's much more fun not knowing what's coming--and in the case of Rowling's delicious sixth book, you don't want to know. Just sit tight, despite the earth-shattering revelations that will have your head in your hands as you hope the words will rearrange themselves into a different story. But take one warning to heart: do not open Harry Potter and the Half-Blood Prince until you have first found a secluded spot, safe from curious eyes, where you can tuck in for a good long read. Because once you start, you won't stop until you reach the very last page. Amazon.com's Harry Potter Store features all things Harry, including books (box sets and collector's editions), audio CDs and cassettes, DVDs, soundtracks, games, and more.